GUTS is an award winning online casino that is going places. Increasingly popular with players thanks to their ballsy unpretentious approach, everything about their website is down to earth and grown up, yet fun; and they use everyday language too – even some of the boring bits (hello T’s & C’s) are mildly entertaining. GUTS is a subsidiary of Gaming Innovation Group (GIG), and as such runs on their proprietary iGamingCloud platform, bringing punters a snappy well laid out interface and no issues with loading times. They make some pretty, well, gutsy claims too, the most eye catching being that they endeavour to process all withdrawals within 2 hours. We thought that might get your attention. Add to this a great selection of games from a variety of top developers, plus a genuinely dedicated and well-informed customer service team and you’re onto a winner. Not bad for a casino that only opened its virtual doors in 2013. UK players who join with code PARTY and deposit £10+ (excluding Skrill/Neteller/PaySafe) can claim a 100% bonus up to a maximum £100. This carries a 35x wagering requirement in 30 days (max £5/spin, some game count less or not at all). In addition you will also receive 50 free spins for a selected slot game awarded 10/day over the first five days. These spins are valid only on the day issued, winnings from spins are withdrawable cash. Once you are on the Casino site it’s all fairly straightforward, there is a search bar you can use if you want something specific or alternatively some category options are listed below. So far so simple. What we really liked, though, is that you can also arrange the results in a way that suits you. For example, you can view games by their logo graphic or just as a written list, and then view them alphabetically or by provider. It helps keep things user friendly and feels like a more personalised experience. There is also the option to create a Favourites list so you can get stuck in immediately if you want to squeeze in a 5 minute session while the boss’s back is turned. Variety is the name of the game at GUTS, and there are a good number of big hitters from the gaming world showcasing their products on this iGamingCloud powered site. Microgaming, SG and Quickspin are there in force, but you can also find plenty of games from IGT, NetEnt and Red Tiger amongst others. During play the side bar lets you know of other people’s successes to keep you in high spirits (or perhaps make you insanely jealous, either or) and push you onwards. Slots – Favourites include Sticky Bandits, Dead or Alive and Break Da Bank Again; although with around 150 slots on offer you could avoid favourites altogether and still not get bored months. Jackpots – This is the only area of the site we found to be lacking, with only a spattering of Jackpot games currently on offer, and not particularly enticing ones either. Live – GUTS really look after you here, with variations on all the classics as well as a few surprises. There are just shy of 30 live games in total, all provided by Evolution, so you know it’s going to be good. Roulette – American? VIP? Immersive? Check. Check. Check. 10 Roulette games are listed with limits to suit everyone’s pocket. Blackjack – Trailing slightly with 9 variations, the Blackjack games are still diverse enough to keep you at the table. Multi Hand and Atlantic City Gold are a few interesting options. Table Games – Three Card Poker, Hold ‘Em and Speed Baccarat and a couple of others bolster the table games on offer. Alongside the Casino page you can also find a Live Casino and a Poker section, which is still relatively new. To be honest the Live Casino tab is a bit of a waste of space as it gives exactly the same result as selecting Live Casino from the options menu on the Casino page, but the Poker tab is interesting. Not only is there is a download option here, but if you are hours into a game and between hands you can play mini casino games on the side to keep you occupied and mix things up a bit. The website is uncluttered without ever feeling dry, and this only helps to maintain its stability and the speed at which it runs. There isn’t much in your eyeline in the way of help (it’s hidden down the bottom) but the Live Chat bubble is omni-present and available 24/7. Although there is no dedicated app available there is a perfectly functional mobile site which offers near enough everything you can find on the desktop site. You aren’t able to personalise things in the same way but that’s hardly an issue, and if you know what you want to play you can still use the search bar or access your favourites. 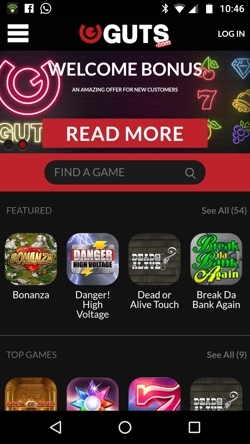 Live Casino is also available on the mobile site as is Live Chat, although you will have to access it from the drop-down menu rather than the speech bubble icon. Plus, most slots are available as a demo on the mobile site too, which is handy. We noticed that after navigating to GUTS and choosing Casino (as opposed to Sports for example) it did take a beat or two longer than we would have liked to load, but once we were in it ran like a dream. The colourful game icons really pop due to the black background, and we instinctively knew how to find what we wanted. Coming into existence back in 2013, GUTS is still an infant when compared with some of the industry giants like William Hill or Coral. However, this kid came out fighting, and their launch was considered by many as one of the most successful online casino launches in history. 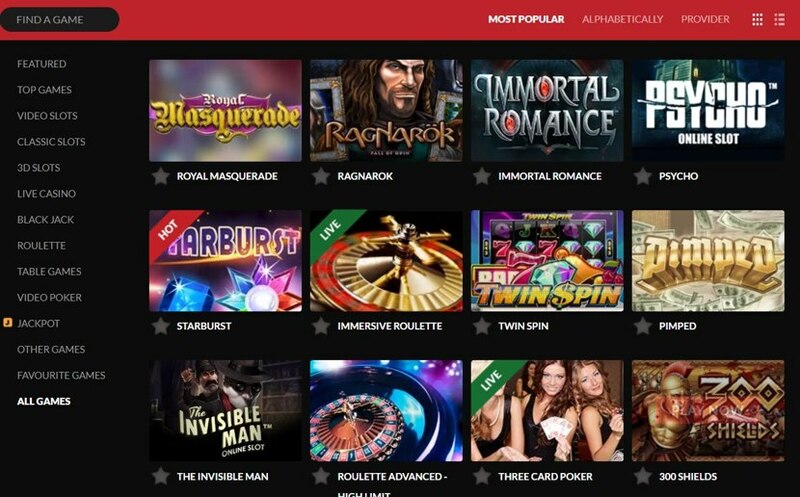 Owned by Gaming Innovation Group (GIG) who also provide B2B services such as iGameCloud which GUTS itself runs on, the casino obtained licensing from both the UK Gaming Commission and Malta Gaming Association in 2014 and started winning awards almost immediately. The casino manager at the time, Ben Clemes, also received accolades himself. Customer service, great games and quick withdrawals have always been at the heart of what GUTS is all about, and it has been by focussing on these three key elements that they have managed to grow at such speed. As we mentioned, customer support really is GUTS calling card, and they do it very well. With a team of less than 50 staff the company retains a personal feel and comes across as genuine and human rather than as some faceless corporation. Live Chat is available 24/7, is picked up quickly and is handled in house, and e-mails are answered quickly as well, although this can vary as you might expect. There is an FAQ section at the bottom of most pages with a sensible selection of questions that is not overwhelming – it can feel like entering the Matrix at some casino’s can’t it – and this may be the best place to start if you have a query. If you would rather speak to someone on the phone you can do this too via a call back service, and they actually will call you back. All in all, the response to GUTS customer support from the gambling community has been overwhelmingly positive. Live Chat– Find the little red speech bubble icon at the bottom right of the page. It will always be there so just give it a click and ask away. Registered Office– GB Buildings, Penthouse, level 4, Watar Street, Ta’ Xbiex, XBX 1301, Malta.